The gorgeous Garden Room, Tamburlaine, Cambridge. A typically pleasing mash-up of pattern, texture and colour. 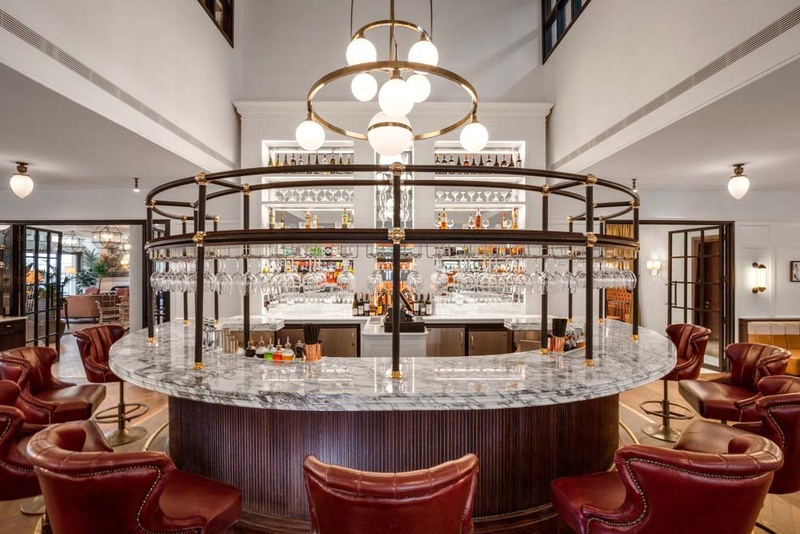 Pull up a chair at Tamburlaine's marble bar. Book-stacked shelves in the lobby, Tamburlaine, Cambridge. 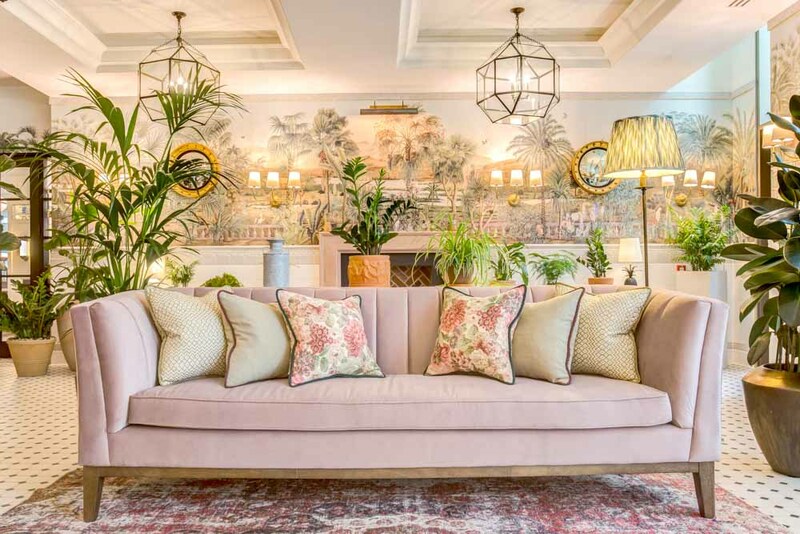 Tamburlaine hotel charms with its playful mix-and-match of patterns, textures and historic references, but what exactly makes it so quintessentially Cambridge, asks Leigh-Ann Pow. 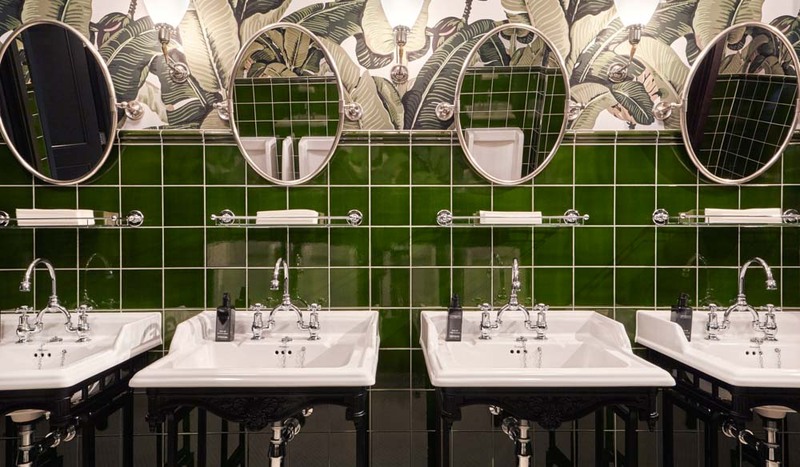 The fact that Tamburlaine, the new luxury hotel that opened its doors in Cambridge in March 2017, is named after a Persian emperor in one of dramatist and Cambridge alumnus Christopher Marlowe’s 16th-century plays is enough to give it a sense of place in the university city. But add to this rooms distinguished by academic terms – Fresher, Scholar and Dean – instead of size, a well-stocked library and a pastel-and-floral-drenched Garden Room, and it couldn’t be more Cambridge if it tried. The layered references play out throughout the hotel, according to designer Bryan O’Sullivan. “The aim was to create an interior scheme that sits well in the historic surroundings of Cambridge. Persian influences were taken from the play Tamburlaine, and the five public spaces in the hotel each reflect a different feeling through the use of colour and texture. The old-meets-new grandeur is instantly apparent upon entering the lobby, with its double-height ceilings, imposing chandelier, spiral staircase and a mélange of bespoke furniture running the gamut from leather club chairs to overstuffed sofas to pieces heavily influenced by mid-20th century lines, and bookshelves inset into walls groaning under the weight of vintage leather-bound tomes. Even the staff adhere to the themes, decked out as they are in a uniform of velvet, plaid and collegiate stripes. Upstairs, the 155 guest rooms are crammed with personality, with floor-to-ceiling windows (some with city views, others with views out to the surrounding countryside), wood-panelled walls and polished concrete floors. Layered on top of this is more bespoke furniture and cleverly curated retro pieces, as well as generous bursts of colour (Cambridge blue is a recurring theme throughout), texture (brass, velvets, plaids) and whimsy; a cute little chinoiserie teapot and cups and saucers are included for enjoying a real English brew. Pull up a chair at Tamburlaine’s marble bar. But it is the shared spaces throughout the hotel that are proving a hit with guests and locals alike. The buzzing bar, dominated by a mammoth, curved marble bar and comfy leather chairs, has become a bit of a weekend hot spot, while the brasserie-style restaurant, finished in leather, brass and salvaged timber, serves up breakfast, lunch and dinner menus of honest, seasonal food made from locally sourced ingredients. 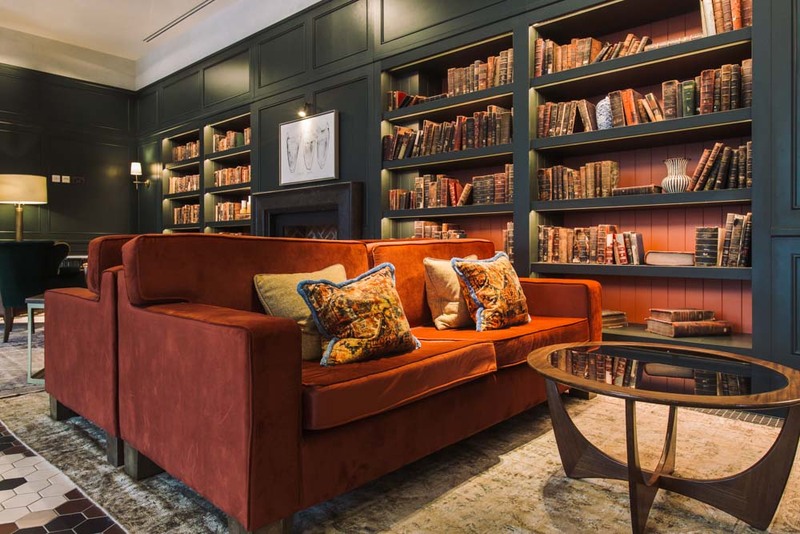 And the library, with its antique books, a generous velvet Chesterfield to plonk down on and an open fire, is the perfect place to retreat to for a few hours. And then there’s the Garden Room, a real treat for the eyes with its painted Victorian wall panels, pretty pastel velvet, silk and white wicker seating arrangements and lush potted plants generously scattered throughout. An instant hit with visitors, who slavishly upload endless images of its dainty details to Instagram, sitting in its genteel surrounds enjoying afternoon tea has quickly become an essential Cambridge experience (one that you definitely need to book ahead for). You can’t get more Cambridge than that! 1. Pop into the bar at Tamburlaine to try one of our quirky cocktails from our head mixologist. 2. Go punting on the River Cam. 3. Do a walking tour of the university buildings. 4. Visit the Botanical Garden. 5. Stop by the Fitzwilliam Museum, which has one of the greatest collections of Egyptian and Roman artefacts.